In December 2006, we met, as we do every year at this time, in a café in Brunswick Street, Fitzroy. The warm nights had returned, the festive season was in the air. The annual letting-go was within reach like a tape at the end of a long distance run. There were perhaps 20 in the group, members of the Melbourne Centre of International PEN. Each of us had a list of names and addresses of writers who had been imprisoned, persecuted, threatened and, in some cases, tortured for their work in the past year. They resided in dictatorships, left and right, in theocracies and monarchies, and in countries that claimed to be democratic. The lists included writers from China, Burma, Ethiopia, and Iran, to name four quite different political regimes. Our task was simple: to send a card with a message of support to the persecuted writers. To wish them well, and let them know they were in our thoughts; that they were not alone. There was good reason for keeping the message simple. We wanted our cards to get past the censors. There is a time for advocacy, and a time for simple words of support. They work in tandem. Together they make up the 'human' and the 'rights' in human rights. 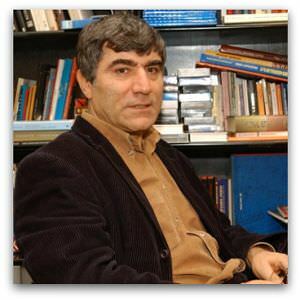 One of the writers we wrote to on that December night was Turkish-Armenian journalist Hrant Dink (pictured). A founding editor of the weekly newspaper Agos, Dink had been outspoken about the 1915 massacres of the Armenians, and named it genocide. For his efforts he had been prosecuted for 'denigrating Turkishness' under Article 301 of the Turkish Penal code. He was acquitted the first time, received a six-month suspended prison sentence the second, and was facing fresh charges drawn up by the prosecutor's office in a renewed attempt to have him jailed. Dink was a leading advocate for freedom of expression in Turkey. In his editorials and newspaper columns, he championed a pluralistic democratic system. He reached out across the cultural and historical divide, and called for dialogue between the Turks and Armenian minority. As a bilingual publication, Agos opened up channels of communication between the two communities. While Dink sought to build bridges between cultures, he understood there could be no genuine reconciliation without recognition of past and present injustices. He exposed discrimination against Armenians in Turkish society, and cases of destruction of the Armenian cultural heritage. He argued that continued denial of the genocide would remain a festering wound for Armenians worldwide. The denial was not only a desecration of memory, but also a blight on Turkish society as a whole. This is the third prong of human rights activism. There is the simple human contact we spoke of earlier, then the advocacy on behalf of those whose rights have been abused, and thirdly the message that persecuted writers are trying to convey. Repressive governments shoot the messenger to suppress the message. As is so often the case, the specific cause has universal resonances. Each denied genocide paves the way for new genocides. Hrant Dink spoke of the annihilation of the Armenians, and as we shall see, he paid a terrible price for doing so. International PEN was formed in 1921 to promote literature worldwide. In 1960, PEN established a Writers in Prison Committee, in response to mounting concerns about attempts, in many countries, to silence writers. The committee documents the cases of writers who have been threatened, imprisoned, tortured, beaten, exiled, or assassinated for their contrary views. Cases are brought to the attention of International PEN's research offices by any one of its 145 centres in 104 countries. These include centres in Sydney and Melbourne, and a branch in Adelaide. Until recently, Australia was one of the few countries that had never had major cases of persecuted writers on PEN's lists. But in mid 2002, Melbourne PEN members were alerted to the plight of Ivory Coast journalist, Cheikh Kone. Incarcerated in Port Hedland immigration detention centre since January 2001, his story came to light due to the efforts of Melbourne schoolteacher, Peter Job. Job first wrote to 'detainee number NBP451' in February 2002, as a participant in a letter writing campaign to detained asylum seekers. When Job discovered the name behind the number, and the details of Kone's case, he contacted Melbourne PEN. The information was forwarded to London for investigation. Meanwhile Melbourne and Sydney PEN members stayed in touch with Kone, in order to assure him of their support, and to buoy his spirits after his many months of indefinite detention. International PEN soon confirmed that Kone was, as he had claimed, a journalist who had genuine fears for his safety if he were to be deported back to the Ivory Coast, the country he had fled in October 2000, after writing articles that exposed the general elections as fraudulent. Because of the new evidence and pressure applied by refugee advocates, Kone was released after 32 months in detention. In January 2005, Melbourne PEN learnt of the plight of Iranian activist, Ardeshir Gholipour. After five years in Woomera, Port Hedland and Baxter detention centres, Gholipour faced imminent deportation when his final appeal for refugee status was turned down. Days later he attempted suicide. The trauma of having spent 27 months in a tiny cell in Teheran's Evin prison in the late 1980s, for distributing pamphlets on behalf of the Iranian Freedom Movement, and of fleeing Iran in the late 1990s, was compounded by long-term detention in Australia. Again it took International PEN just days to verify Gholipour's claims. In the meantime it was crucial, given his fragile state, to assure him he was not alone. Melbourne and Sydney PEN members, and other refugee advocates regularly conversed with him by phone, while his appeals dragged on. Gholipour was finally released in April 2005. As he stepped out of Baxter, a free man at last, refugee advocates and members of PEN were waiting to greet him. The campaigns to release Gholipour and Kone exemplify the three prongs of human rights activism, working in tandem. The two cases came to light because concerned Australians had written letters to detained asylum seekers as simple acts of humanity. The letters assured them that despite efforts to isolate them from the outside world, they were not alone. In both cases, direct human support helped prevent a further descent into depression. When Peter Job first made contact with Kone, Kone was, in his words, going crazy. The letters and phone calls eased the pressure. Gholipour, who had been driven to the point of attempted suicide, was sustained by his regular contact with supporters. At the same time, individuals and organisations continued to apply pressure to have the two cases reconsidered. The campaigns included newspaper stories, delegations to parliamentarians, legal representation, and pressure upon the Immigration Minister and departmental officials. The message that Gholipour and Kone conveyed can be seen as having two components. They had the courage to expose gross human rights abuses in their respective countries. And the campaign to release them helped expose the abuses and mental anguish resulting from indefinite detention of asylum seekers in Australia. Hrant Dink was not so fortunate. On 17 January 2007, he was gunned down outside his Istanbul office. His killer was a 17-year-old ultra-Nationalist. On that warm December night in 2006, Melbourne PEN members sent two cards addressed to Dink. Due to reasons unknown, his reply arrived in May, months after he was murdered. The card, designed to raise funds for a children's education foundation in Turkey, features an image of a peasant boy at menial labour, dreaming of being able to attend school. 'With this card, your contributions are helping to make a difference in a person's life,' the caption reads. Having spent years in an orphanage as a child, Dink was committed to universal schooling. These words were written weeks before his death. The card remains a poignant reminder of the risks human rights advocates face in courageously pursuing their goals; and the power of a few simple words of understanding. Arnold Zable is an Australian writer and story teller. His latest novel Sea of Many Returns was published in June 2008. The above essay was Highly Commended by the judges of the 2008 Eureka Street/Reader's Feast Award for Humanitarian and Social Justice Writing. Recent articles by Arnold Zable. Yes, I agree, an excellent story. Why hasn't there been more response to it? So moving. The courage of some encourages us all. Thanks for the Links to PEN.